Why "kick him on!" is not an appropriate way to deal with a fearful horse. Your horse is tossing his head in the air when spooked? A martingale will help you with that! 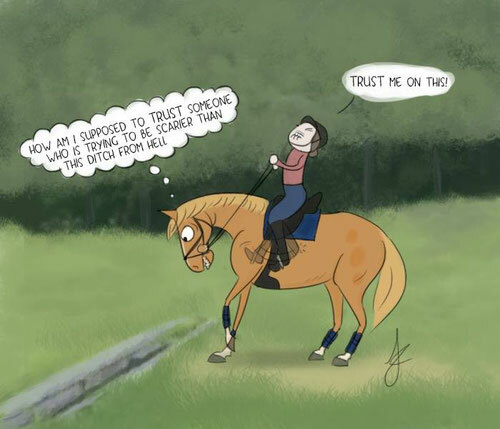 Your horse doesn’t stop when scared? What about using a stronger bit or bridle! Oh, and don’t forget the flash so he cannot escape it. Your horse is afraid of plastic bags? Run after him in a round-pen with a plastic tarp until he gives in. Your horse is scarred of the water jump? Kick him and whip him relentlessly until he jumps it. Your horse doesn’t want to leave his pair-bond behind? Kick him on, turn him in circles, and don’t let him win! These solutions are often accompanied by the belief that the horse is somehow trying to trick you, being naughty, lazy, silly etc. 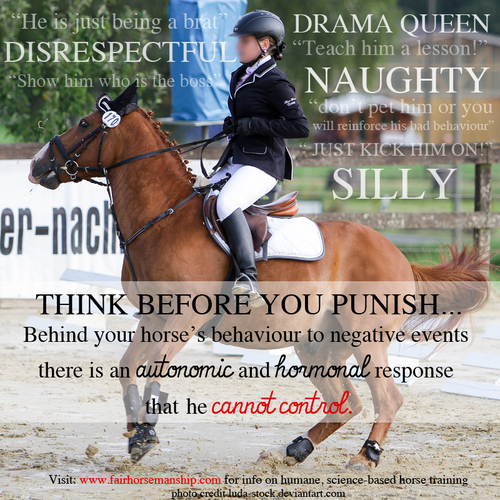 It implies that the horse is in full control of his behaviour when in fact he isn’t. The behavioural response. For example: running away. The autonomic response. For example: increase of heart rate. The hormonal response. For example: increase of blood flow due to adrenaline. To state the obvious: your horse cannot control his biochemical response to stress, which produce his “fight-or-flight” response. Drawing courtesy of "Fed up Fred"
These solutions rely on the use of emotional and physical pain and discomfort. Fear causes the release of beta-endorphin, which numb and reduces emotional and physical pain. We all seen horses spook and riders pulling with all their strength on very harsh bits and yet having very little success in stopping their scarred horses. These solutions focus exclusively on reducing the behavioural response (symptom), not on eliminating the fear (problem). A horse standing still can still be experiencing fear. A fearful horse is not a happy horse or a safe horse. Most of these solutions rely on you trying to be scarier than whatever scarred the horse in the first place. Not only this is not a sustainable solution but this will also ruin your relationship with your horse. Solutions involving flooding (example 3) are considered highly unethical in the treatment of humans suffering from phobias and therefore should also be considered unethical in the training of animals. Flooding causes brain fatigue and the individual either becomes shut down or highly phobic. The appropriate way to deal with a fearful horse is prevention by training. Read more on how to humanely and efficiently train your fearful/anxious horse.